Chia seeds are one of nature's most perfect natural food, and regarded by many nutritional experts as the pinnacle superfood. Chia is a food that gives you high sustained energy, high fiber, and high perfectly digestable protein for muscle, and tissue regeneration. There are immediate benefits and accumulated sustained health benefits from including chia seeds in your eating habits. Some like energy, and healthy regularity, you will notice right away. Others like joint support, cardiovascular health, weight loss, muscle regeneration, etc. will exhibit itself after prolonged use. Overall, your health will be greatly improved with the regular addition of chia seeds to your daily eating habits. Small healthy changes to our daily habits that will become part of our enjoyed healthy daily routine will become second nature and greatly improve our quality of life. Many respected experts say if they could have just one cup of food a day, chia seeds would be it. Not only does it have super nutritional value, but it tastes good, is inexpensive, goes well with many other foods, supports weight loss, and helps with a variety of medical conditions. Below we have listed short summaries of it's various benefits. The more you learn about, and try chia seeds, the more you will love them. Chia played major roles of importance in the Aztec, Mayan, and Inca cultures; even traded as currency. 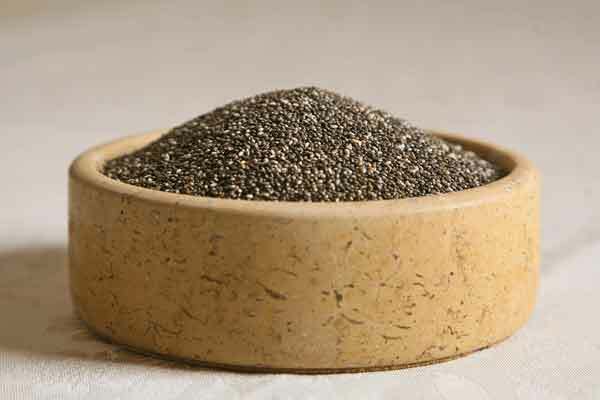 Often warriors would carry chia seeds, and consume as little as a spoonful, and run all day. It was known as 'running food' and was regarded as a mega energy food. Chia (Salvia Hispanica) is a plant in the mint family (Lamiaceae). It is an annual herb that grows to one meter tall and produces purple or white flowers that go to seed. Chia is the Mayan word for strength. The word chia is derived from the Aztec word chian, meaning oily. The Mexican state of Chiapas got it's name from the Nahua 'chia water, or river'. Chia seeds are small oval seeds with a diameter of one millimeter. They are brown, gray, black, and white. They typically contain approx. 20% protein, 34% beneficial oil, 25% dietary fiber, and significant levels of antioxidants and Omega 3 and 6. The U.S. Food and Drug Administration regard chia as a food with an established history of safe consumption. There are no known toxic effects of chia seeds, so you may consume without worries. Chia has a higher percentage of protein than any other grain. Chia's protein is easily absorbed and digestable and can replace the protein supplied in protein shakes. It is a complete protein source, with all the essential amino acids (19 amino acids total) in appropriate balance. Chia is an excellent food source of high fiber. 5%-10% mucilloid soluble dietary fiber (helps lower cholesterol and manage diabetes) 90%-95% insoluble dietary fiber (promotes healthy regularity). Taking chia daily will greatly aid your regularity, and sweep out old debris in your intestines helping to detoxify your system naturally. Chia aids in the assimilation of other foods and hydration retention. Chia is a natural food that has high antioxidant levels, more than blueberries. This gives dry seeds a 4 to 5 year shelf life. To name some of the more important antioxidants chia provides: chlorogenic acid, caffeic acid, myricetin, quercetin, and kaempferol flavanol glycosides. Chia is the richest natural source of Omega 3. Omega 3 and 6 help our brain functions and brightens our mood. They also help our central nervous system and cell membranes health. Chia has a favorite ratio of Omega 3 to Omega 6, and has the highest known natural percentage of alpha linolenic fatty acid. More than flax seeds (which needs to be ground, and has a limited shelf life) or salmon. Omega oils are important for vitamin assimilation, and for the health of your vital organs, especially your thyroid and skin cells. Chia contains long chain triglycerides in the right proportions to reduce cholesterol on arterial walls. Chia is an important part of heart healthy eating and cardiovascular health. Chia is known as a mega energy food. Atheletes (like runners, climbers, weight lifters, etc.) take it because of it's prolonged sustained release of energy. It has twice the potassium as bananas. It easily gives me sustaining energy for my daily cardio and resistance workouts. You will be amazed at your energy increase. Chia is called the 'Dieter's Dream Food'. It bulks up other foods, displacing calories without changing the flavor. It is filling, so you eat less, yet you don't feel weighed down. It also helps clean out your intestines. Chia seeds promote regeneration of muscles and tissues that have been damaged. Chia's essential fatty acids boost metabolism and given it's being an optimal source of protein and balanced amino acids, build and maintain lean muscle mass. Chia seeds and chia seed oil, applied externally, or taken internally, are great for your hair and skin. Chia seeds are great for the 'diabetic diet'. When eaten with other foods it creates a physical barrier between carbohydrates and the digestive enzymes that break them down. This slows the conversion of carbs into sugar. The energy from food is released more steadily, thus not getting a sugar spike after eating foods. Chia helps lower insulin sensitivity. It also lowers systolic and diastolic pressure. Daily use of chia over time will greatly reduce or eliminate joint pain. Many with joint pain and the choice of surgery or giving up physical activity, experience an end to joint pain after a few months of use without giving up activities they enjoy. One property of the chia seed, when exposed to liquid, is that it is a hydrophilic colloid. That is a gel like substance thats forms the underlying elements of living cells. The seeds absorb and retain 10-12 times their weight in water. Consuming them helps you retain hydration and your electrolyte balance. This property also aids in the digestion of other foods. Chia is very easily digested and assimilated by our bodies. There are no known food allergies, or sensitivities to chia. It is not toxic. Insects dislike chia, so it is not treated with pestacides. It is mechanically harvested and cleaned. So it is naturally organic. Don't fall for the high prices of organic or white chia. Chia is typically the same. Chia seeds can be found at health food stores, or ordered online. A pound of seeds costs typically between $9-$16 and is a 2 to 4 week supply. One fantastic property of chia seeds is they have a very long shelf life. 4 to 5 years for dry seeds, and 2 to 3 weeks for refrigerated gel. The taste of chia is very mild. Many say it has no flavor, while some say it tastes slightly nutty. You can take chia seeds raw by themselves, or sprinkle them on salads, soups, cereal, etc. Try stirring it in your favorite greek yogurt. The easiest way to take them is to stir a couple of tablespoons in a glass of water, stirring occasionally to keep from clumping, waiting about 5 minutes for the seeds to soften, then consume. You can also cook with them and add them to virtually any food or drink without changing the flavor, but greatly enhancing it's nutritional value. When chia seeds come in contact with liquid, they start to turn into gel. This gel is a great thickener for sauces, etc. A chia gel is made by adding a small to moderate amount of water to a portion of chia seeds, this is perfect to add to recipes and will keep for weeks in the refrigerator. Cooking does not negatively effect the good properties of chia. Many like chia in their juices, smoothies or shakes, others like to take the gel in their baked goods. Chia Fresca is fresh natural lemonade mixed with chia seeds, it is refreshing and very nutritional. Chia flour, chia oil extract, and chia sprouts are also available. We like to take 2 tablespoons in a glass of water about 3 times a day, it's easy and efficent.